about half a year ago I submitted an implementation for manual movie organization through the auto-organize feature (https://github.com/M.../Emby/pull/1202). As of today, I'm still clueless about when this feature will actually be included (or if it will be included at all). I don't mean to criticise the prioritization of features as I'm unable to estimate user interest for this feature. It's just that I need it for my personal use, and that's why I wrapped this functionality into a PlugIn. Edited by softworkz, 23 November 2016 - 09:58 PM. 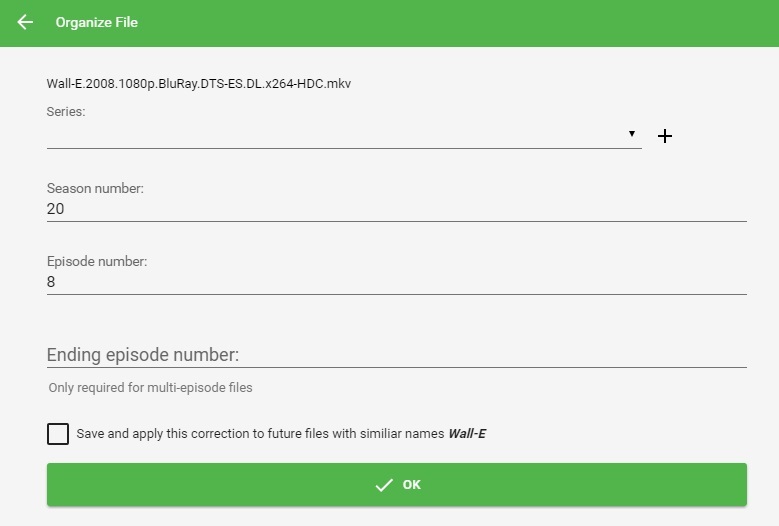 If an incoming file couldn't be identified automatically, it will show up as red entry in the "Auto-Organize Log"
Clicking the folder button next to such entry, will bring up the correction dialog, which allows matching an episode to the correct series. Now you are also able to organize an incoming file as Movie and have it copied/moved to the selected library folder automatically. softworkz, this is great! Thank you! With our new handling of recorded TV basically doing this same thing, what is the source of an incoming movie file for which this would now be used...? External TV providers maybe? Well, no, I actually can't. If you are ripping from physical media, you know what it is and put it in an appropriate folder. If you are "acquiring" it via something like CP, then that program knows what it is and, again, puts it in an appropriately named folder in the proper spot. The same question can be asked for the "normal" Auto-Organize (handling series episodes only)... - what is the source of these incoming episodes? Why does Emby have that auto-organize feature at all? Well, that's why I asked it because, once we have the integrated recorded TV for all TV providers, that will no longer be needed so much either. My question isn't to ferret out bad behavior. It is to understand just exactly how useful these features will be given the direction we're going with recorded TV. How do you come to this conclusion? This sounds as if there hasn't been any use for MediaBrowser during the past years, before it had got some live TV features.. In the past, I have always separated Emby content from RecordedTV (using Emby for WMC), and I'm not planning to change that. WMC RecordedTV contains daily recordings of low to medium quality (even HD channels from PayTV are of inferior quality compared to BlueRay streams). Other users may have much different scenarios. But I think there will always be users integrating content which does NOT come from RecordedTV (just the way MediaBrowser had always been used). nzb downloads often have names your auto organize can´t handle. it is better to let the user decide what implementation of a function works better. I completely understand where ebr is coming from, on this. Now that we can select where we record any data, it's redundant. I actually want an option to disable auto-organize so I don't have to set it to watch an empty folder. Anything I 'acquire' I can save directly in the correct folder. If renaming is required, I use media center master, as that will rename, clean up the folder and create nfo files, without moving anything. If auto-organize can do the same, that would be useful. Edited by Doofus, 26 May 2016 - 11:39 PM. could you help me to use this plugin on Linux? I've built emby-master with xbuild. I guess I need to build also this plugin manually. which version of emby-master is suitable (it might also need to be recompiled)? how can I compile this plugin with mono (xbuild)? It has now failed with ~200 errors at my side. Could you provide some information regarding folder layout, what needs to be where? Note: If I copy the dll itself into emby's dir, it's simply not working. Edited by danergo, 27 May 2016 - 08:39 AM. The plugin will need the latest dev build! Please try again with that.. It is easy to disable: Just go to "Scheduled Tasks" and remove the task trigger for "Organize new media files"
Thank you, I'll try with that one. However, what should be the directury structure? I have the plugin src which contains a lot of "MediaBrowser.Plugins. *" dirs. Do I need to copy the emby-dev folder next to these directories? or it needs to be at the same level as the Emby.Plugins-MOBeta1? In this case, which name is suitable? emby-dev or emby.dev? There's no need to mess with the scheduled task. Just don't put anything in your watch folder and problem solved, or remove your watch folder. Maybe @Luke can give you some hints on compiling for Linux? I am nearly done identifying all movies in emby. Now I search for a solution to rename my files so they are 100% recognizable. If I were to change the folder structure or move to another server most of my files would not be scraped properly. Can your plugin rename files based on the info I put into the emby database, or do I have to go through every movie again? I would really like to find a solution that names all my files like [name].[year]. [quality] or maybe even include IMDB identifier.